This is small post regarding an important feature of IE deities , Polycephaly . From a discussion with some friends , I became aware of this interesting topic . It is also worth noting that multi-headed deities with human shape appear only in IE cultures ( E.g. Greek, Roman, Slavic), see here . In Indian tradition, there are also various examples. One of the well known one is Pashupati . He has five faces, but one is invisible. Also as a friend points, Shiva in Elephanta for instance has three faces, this 'device' was applied often in Indian art and myths to plastically show different aspects in one deity. 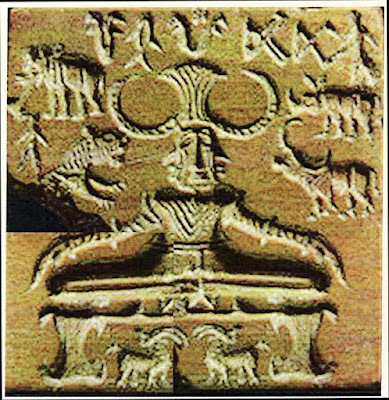 But it is indeed remarkable that it was already present in Harappan art , the famous Pashupati seal . Here an artificial attempt to complete the seal . I found it here . A key feature of the Indo-European mythology is the Polycephaly, which exists also among the various Slavic peoples. Like the god Svantevit/Svetovid or Triglav, whose idol was represented with four heads suggesting the four cardinal directions and could read the future, so was the god Janus in the Roman mythology, and Typhon and Hecate in the Greek one, Brahma in Hinduism, or the giant Þrúðgelmir in the Scandinavian mythology. So , this key feature is present in Indian tradition , from the times of Sindhu-Sarasvati Civilization . We can add the Celtic deity Lugus in the same category . He is depicted as tricephalic. tiger/lion opposition to buffalo shows up in indian myths of durga in most of india and ayappa in kerala. We have 3, 7 and 40 headed dragons called devs.Most of the time they are evil but sometimes they are smart and kind. No mulriheaded god afaik. But I will ask mt friend who knows better. Very welcome Vineet ! :) . Yes exactly . I am trying to gather more data. It reminds me of a Catholic picture in Bolivia made around the beginning of 20th century, it is calles "Jesus del Gran Poder", it had three faces, but eclesiastical authorities errased two, now the picture has only one head. A tricephalic celtic head: the corleck head.